The combination of linear plain bearings with supporting rollers offers low driving forces with no requirement for lubrication. Wherever manual sliding applications are situated, for example on machine sliding guards, safety doors, control panels, and theatre stage actuation. Quiet operation without the requirement for lubrication is entirely possible with the drylin W hybrid system. The hybrid carriage from igus on the drylin W rail profile, made from hard anodized aluminium, utilizes the advantages of sliding and rolling, since they are lubrication-free and can simultaneously move larger loads without excessive driving forces. This space-saving technology with only one guide rail is, for example, suitable for the adjustment of sliding doors or enclosures and allows for maximum freedom at the design process. They enable an easy manual adjustment with very quiet running. The drylin W hybrid carriage is also available in a compact design with a length of only 90 millimetres. Thus, designers can minimize the impact of introducing a linear slide by using the hybrid system. At the same time, the overall structure remains inconspicuous, even here, since it does not require a second guide as support. As in the case of the larger version, the roller guide is secured on the rail, eliminating the risk of carriages leaving the rail. Like all plain bearing products from igus, the drylin W hybrid carriage does not require lubricating. This makes them, on the one hand, suitable for applications in the food and packaging sector, as there is no grease or oil to contaminate the food. On the other hand, they can also easily be used in adverse environments, such as in machine tools. No dirt or dust particles can accumulate on the bearings, which could hinder long-term operations. More sizes will be available soon. igus GmbH is a world-renowned for its expertise in the manufacture of energy chain systems and polymer bearings. The family-run company based in Cologne is represented in 35 countries and employs about 2,400 people worldwide. 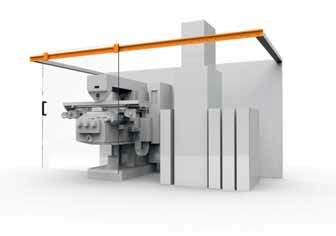 In 2013 igus generated a turnover of €427 million with ‘motion plastics’, plastic components for moving applications. igus operates the largest test laboratories and factories in its sector which enables it to offer the customer innovative products and solutions tailored to him in the shortest possible time.